With IoT evolving, here's a look at a little-considered use case: dealing with food waste. See how connected devices can reduce wasted food. Smart home products have undergone a number of iterations. In the first wave of smart home devices, we saw a particular focus on the basics, like smart lighting and home security. Then, over the last year or so, whitegoods and kitchen goods have been rising to the challenge, largely lead by big brand companies wanting to get their hands on the subscription as a service model of retail, with their product owner a customer for as long as they own their whitegood(s). Yet as one on a budget, most smart home products are out of my reach in terms of financial access, or just don't get me all that excited — heck, our Alexa is mostly used to make silly noises, or answer childish questions like 'Alexa, what noise does a cat make?' But every now and again, I come across a product at a reasonable price point the piques my interest. In comes Ovie smarterware, now on sale via Kickstarter to help your food last longer and reduce your food waste. How Big Is the Food Waste Problem? American families waste about 40% of the food that they bring home from the grocery store according to a 2012 National Resources Defense Council. Other statistics globally, suggest a wastage of 20% or one bag of groceries in every 5, no small amount when you think of money wasted. In response, Ovie, a Chicago based tech startup, has combined a connected app with thoughtful product design to create a smart food storage system that will eliminate waste and change the way people eat, save, and shop for food. Put simply, Ovie's smart food storage system helps you keep track of the foods in your fridge and remind you to eat them before they go bad. The Smarterware product line consists of Smart Tags, 6-cup containers, clips, and universal connectors that can attach to any container or bottle in a fridge. Each tag features a light ring to give instant at-a-glance visual cues showing the freshness of every tagged item in the fridge. For instance, the light starts off on green meaning it’s safe to eat, then turns yellow to show it should be eaten soon, and then ultimately to red when it’s time to throw it out. Alexa Integration — of Course! The real benefit of Ovie is that the Ovie Smarterware system turns an ordinary fridge into a smart fridge, but without the smart fridge price tag. We've seen the big box retailers rolling out connected devices over the past few years, like connected fridges which include iPads, cameras, apps and personalized shopping for individual family members. Yet they've not created enough of a consumer demand that the products have moved beyond the wealthy early adopters (for example a Samsung smart family fridge retailed for $6000). Let's also not forget that the functionalities of such a fridge can to some extent be replicated by a laptop, mobile or another connected device in close proximity to the kitchen. I can see the benefit of combining Ovie's products with other connected kitchen products for a real connected kitchen (the price is still cheaper combined than a stand-alone smart fridge). For example, Smarter’s FridgeCam, a wireless fridge camera that allows users to see the contents of their fridge from wherever they are via the app. The camera takes a photo of the contents of the fridge every time the door is shut, which is then displayed via the Smarter app. Fully automated replenishment service, products can automatically be added to an online shopping basket, allowing the user to buy what they need when they need it. I'm also a big fan of the Whirpool ZERA food recycler, the first indoor recycler in the US that converts a week’s worth of food waste into ready-to-use homemade fertilizer within 24 hours by using a combination of oxygen, moisture, heat and mixing to expedite the decomposition process. 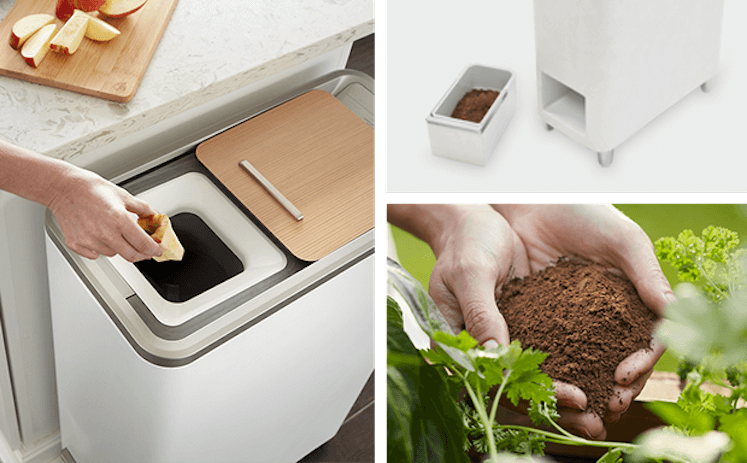 Unlike traditional composting methods like worm farms and Bokashi bins, families can use the Zera system year-round regardless of the weather and can remotely operate the appliance through an app that monitors the fertilizing process. It raised over $500k on Kickstarter last year. Presently, the price of $899 makes it rather prohibitive to all but the most ardent green folk, but it’s one of those products likely to have lower priced imitators in the future. It would be interesting to see some stats on how much money a household could save over a year due to reducing food waste through the use of connected products. It could offer a compelling reason for such products to move to the 'essential' category.